Take a quick look at your vehicle’s door sills, chances are this is an area of your vehicle you don’t pay a ton of attention too. Chances are also high that they’re damaged. 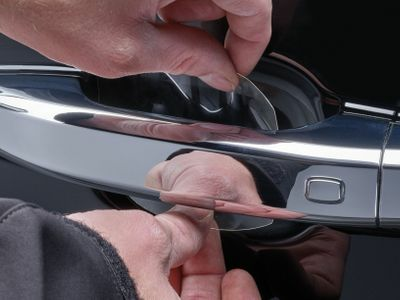 The same is likely true with your vehicle’s door handle cups, door edges and even trunk ledges. Everyone of these areas take damage from rocks, keys, footwear and even just loading and unloading cargo. Don’t let these areas of your vehicle go neglected any longer. WeatherTech Scratch Protection is custom measured by our own engineers to precisely fit your 2017 BMW 3-Series (F30/F31)’s exact make and model, safe-guarding your vehicle from scratches, scuffs, dings and chips to your vehicle’s door sills, door handle cups, door edges, and trunk ledges. Unlike some competitor products that use a generic one-size-fits-all approach, Scratch Protection is created to perfectly fit your exact vehicle providing complete protection against everyday wear and tear. Made of a high-performance polyurethane film that’s virtually invisible, Scratch Protection adheres directly to your vehicle’s painted surface without damaging the paint or finish. Featuring self-healing technology, Scratch Protection is durable enough to stand up to the toughest chips and scratches. ScratchProtection is proudly made in the USA! Installation Scratch Protection includes easy-to-follow instructions that will help guide you through the installation process in no time! However, if you’re not 100% comfortable installing Scratch Protection yourself, it can be installed professionally.